There are plenty of choices of human foods that are good for your dog, and he or she will love the taste. You'll know that what you are feeding your dog is healthy. As a pet owner, you have probably heard from time to time that some human foods are not appropriate for your pet. Here we will talk about five of the healthiest food options. They are as healthy for your dog as they are for the rest of the family! Each one is quick and simple to prepare, too. A tasty treat for your dog is a fresh sweet potato. You could bake it to a soft consistency. Some people find it easier to cut it up and boil the potato. Make sure it's a sweet potato from the produce department as opposed to the canned version of yams. The candied yams that you buy in the can are sugary, and they may be too sweet for your dog. Like all of the orange colored vegetables, these are loaded with nutritious value. They contain vitamin B6, vitamin C, fiber, and beta-carotene. Mash a tablespoon or two without the skin, and add it to your dog's wet or dry food. Depending on the size of your dog, you can also serve it in small, soft chunks. As an added tip, you can do the same with fresh carrots. They contain these same healthful nutrients, and they are also good for your dog’s teeth. Your dog will love the taste of liver. Fresh liver is sold as either beef liver or calves liver. It can be baked, broiled, or fried in its own natural juices. Add a few liver slices to your dog's regular dog food. He or she will enjoy a few cooked chicken slices as well! Serve a few chunks of liver as an added treat. As kids, we were always told to eat our liver because it's good for us. It is also a healthy choice for your dog. Liver has plenty of protein, and it is high in vitamin A, vitamin B, and vitamin K.
Cook up some salmon for your dog by baking it as you would for yourself. Dogs love the taste of salmon, and it has a wealth of nutrition and health benefits. Cut it up in small slices or chunks, and be certain that it is deboned. Another healthy fish option is fresh tuna, which can be prepared in the same way. Salmon is rich in omega-3 fatty acids. It is a healthy supplement for your dog for a number of reasons. Salmon can help keep your dog's coat shiny and healthy. Additionally, the omega-3 is good for eye health, and it helps to maintain brain function. Peas are a healthy and easy addition to your dog's diet. They can be cooked and served soft. Mix them together with regular dog food. You are dog will also love them whole. Simply add some loose peas into the bowl and your pet can munch on them as a nutritious and tasty snack. Green peas are healthy because they contain phosphorus which is great for bone and teeth health. They are also a good source of potassium and the B vitamins. Yogurt is a great human food to feed your dog. It also has the added benefit that there is no preparation time at all! Just drop the yogurt into your dog's bowl, and your dog will be delighted with it. If you are not sure if your dog is lactose tolerant, start with a small amount at first. Because it contains probiotics, yogurt is easy to digest and is beneficial to your dog's digestive health. It is also a good source of calcium for your dog, as is cheese which is another calcium-rich food that your dog will enjoy. You will feel better knowing that your dog is eating these highly nutritious foods and snacks! Please remember not to overfeed your dog with any of these, or other, healthful foods. 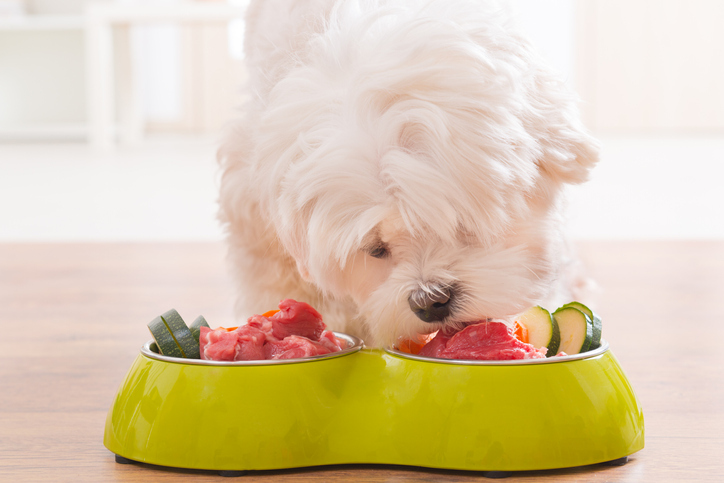 Serve only in a serving size that is typical for your dog's size and weight. Corey has been hand-crafting custom leather dog collars and leashes since 2012 at www.genuinecollars.com to satisfy the need for high-quality accessories for our canine friends.